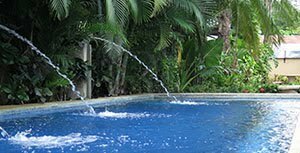 Hotel Coco Palms is located in Playas del Coco, Guanacaste, Costa Rica. Daniel Oduber (LIR). Coco Palms features a cool environment surrounded by a tropical garden. With outdoor seating by the pool, you can relax by the soothing sound of the decorative fountains. There is no need to drive you're on the beach and in the center of town, enjoy! A just 50 meters to the beach. Sign up Hotel Coco Palms email list! in Playas del Coco, Guanacaste. lush common areas and all in the center of town.